The lesser-known but plucky and defiant contender was The Hurt Locker. Confident after 6 wins at the Baftas the film also had 9 nominations and was ready to stand up to its money-making bulldozer of an opponent. Made for a comparatively miniscule $11 million and directed by Cameron’s ex-wife Kathryn Bigelow (Point Break, Strange Days), the film last night pulled off a David and Goliath-like victory. Bigelow made history by becoming the first woman to take away the Best Director Oscar in the 82-year history of the Awards. Her film swept the board by picking up five further gongs for Film Editing, Sound Editing, Sound Mixing, Writing (Original Screenplay) and the coveted Best Picture award. 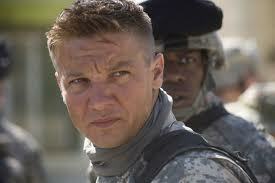 Based on the first-hand account of screenwriter and journalist, Mark Boal, who spent 30 days embedded with an EOD (Explosive Ordnance Disposal) unit, the film tracks Staff Sergeant William James (Jeremy Renner), Sergeant JT Sanborn (Anthony Mackie) and Specialist Owen Eldridge (Brian Geraghty) as they countdown the final 39 days of their rotation in Iraq. We are dropped into the bombed-out wasteland of Baghdad in the film’s opening seconds and are there to stay. Shots of civilians running frantically to escape the imminent threat of a road-side bomb and the urgency of the soldiers are paired with shaky, hand-held camerawork, rapid editing and a documentary-like realism which all serve to create the knife-edge tension which dominates the film. The devastating bomb blast in this opening sequence is seen in slow-motion as dust jumps off a burnt-out car and gravel leaps from the ground, producing breathtakingly vivid visual effects. Unlike the majority of Iraq war representations, The Hurt Locker has no strong political pretence or intention and instead is a study of the effects of conflict on three men who are in a constant battle for survival. However, the quality of army provisions and material is called into question on several occasions and during one manic gun fight Eldridge rather hopelessly asks, “What are we shooting at?”, suggesting that the soldiers are ill-equipped and ill-informed about an enemy that remains largely unseen and unknown. Upon his first mission with Sanborn and Eldridge, James advances (rather too confidently) along a deserted street to a suspected IED (Improvised explosive device). Shots both to and from windows and rooftops, occupied by on-looking eyes, down to the street below relate the pressure of the situation and the perilously thin ice on which they tread. Simmering criticism of the war does subtly bubble to the surface at times but remains largely shadowed by a strongly character-driven narrative. In this respect perhaps the boldest move that the film makes is the very limited screen-time which it affords the two biggest names on the cast-list. Guy Pearce and Ralph Fiennes make little more than cameo appearances. This is a commendable move on their part and allows the lesser-known actors to create a dynamic trio of opposing personalities through solid performances. After losing their Sergeant in the initial blast, Sanborn and Eldridge see James come in to take his place. To say that there are teething problems would be a massive understatement. His recklessness and disregard for procedure on several occasions borders on the insane – faced with a trunk-full of explosives he takes off his protective suit, saying that “If I’m gonna die, I wanna die comfortable”. We smile at his nonchalance and bravado whilst at the same time holding our breath at the unbearable tension of each bomb disposal. A quote from war journalist Chris Hedges, on which the film opens, seems to pinpoint his adrenaline filled thrill-seeking: ‘The rush of battle is often a potent and lethal addiction, for war is a drug’. However the character that Renner creates is in no way one-dimensional and his performance is far more nuanced than most gung-ho military lead men. Visibly traumatised by the mutilated body of a young Iraqi boy and unable to utter a word when phoning his wife and young son back home, he is shown to be a more compassionate and vulnerable character than his initial antics suggest. Although The Hurt Locker has come under fire from Iraq veterans for its supposed misrepresentation of the conflict, Bigelow respectfully paid homage to the servicemen and women who are its inspiration. There seemed to be no animosity between the directress and Cameron during the ceremony but there was no recognition for her former husband in her acceptance speeches and surely there can be no better way to get one up on one’s money-rolling ex than by completely trouncing him at the largest movie event of the year! In short, The Hurt Locker’s overwhelming victory reaffirms the value of outstanding independent filmmaking in the face of Hollywood big business, was a deserved winner and is a film that I cannot recommend highly enough.